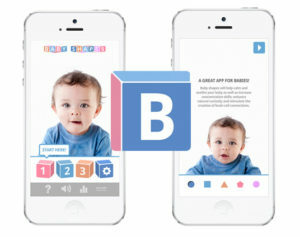 A great app made just for babies! Baby Shapes will help calm and soothe your baby as well as increase concentration skills, enhance natural curiosity and stimulate the creation of brain cell connections. Research has shown that the secret to infant visual stimulation lies in high-contrast colors. The development of a newborn’s eyes – the structures of the retina that perceive color – haven’t matured enough to perceive the values and intensities of red, blue, pink, yellow, purple and green. Black and white are the easiest for babies to perceive and interest in these strongly contrasting colors will pave the way for your baby’s brain development. As all babies are different so are their needs. Rather than predetermined levels Baby Shapes gives you the power of configuration! You can make changes in the configuration screen and discover through experimentation what stimulus your baby reacts to the best, and with time and patience, adjust these to suit. Start with a simple shape of black and white on black or white background. In time, you can introduce red as another contrasting color and as the months pass and your baby’s eyesight and brain develops, you can progress to more complex shapes and begin to introduce colors to further stimulate your baby. Play Baby Shapes with your baby, interacting as your baby focuses on a shape. In time, your baby will learn and discover the possibilities and joy of playing with the moving shapes. In time, you may be interested to learn more about how your baby has been interacting. The statistics screen can provide you with useful information about the progress and development of your baby.